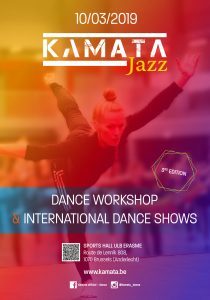 At this incredible “KAMATA JAZZ” event you can discover AMAZING instructors coming from all over the world. On Sunday, 10 March 2019, the day ends with a dance contest judged by a highly qualified jury. 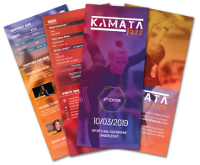 This is the third edition of “KAMATA JAZZ”. Our goal is to bring national and international dancers together. This event is accessible to students, semi-professional and professional dancers. Its “Open level” formula allows everyone to discover, learn and immerse themselves in different styles of Jazz & Contemporary dance. 4 open level classes (4x 1h30) : Contemporary, Urban Contemporary & 2 Jazz classes. Shows brought to you by different Belgian dance schools and a choreography competition for professional dance teams – Show Time starts at 7.30PM. These semi-professional students will show that they are able to create routines on their own and perform in front of a lively audience of dancers. Exclusively for professional dancers. This is a high level competition, and we will carefully select the groups in accordance with their experience. CASTING ? Send us an internet link at dance@kamata.be with a minimum of 2 minutes choreography performed by your team, before February 18, 2019. Come with your INVOICE & ID CARD.